The world has already moved on to Captain America: Civil War casting news, but Avengers: Age Of Ultron is still theoretically the big Marvel property in the zeitgeist. 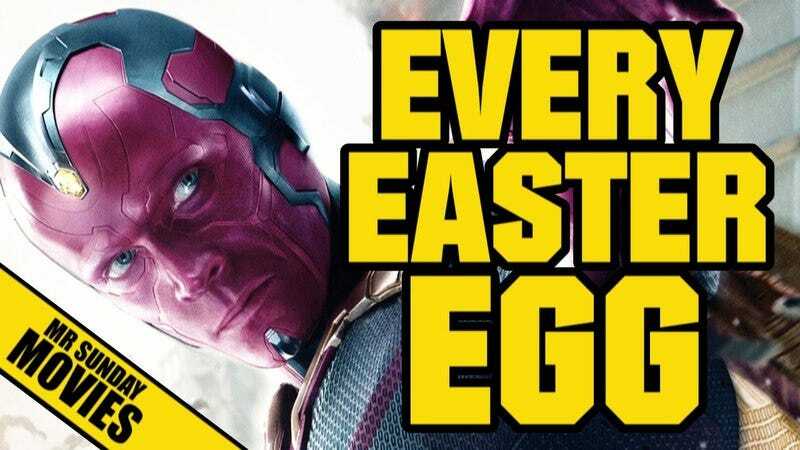 And YouTube user Mr Sunday Movies has created a six-minute video that charts all the Easter eggs and references from the film. There’s nothing too groundbreaking here, but the video does a good job of explaining which comics the film took inspiration from as well as pointing out lines that either reference previous Marvel movies (Falcon is still off hunting Bucky Barnes as was set up in Captain America: The Winter Solider) or set up future ones (Andy Serkis’ Ulysses Klaw will likely be the main villain in 2018’s Black Panther). It’s helpful context for those not engrossed in Marvel lore—particularly when it comes to things like Infinity Stones and/or Gauntlets. Although those who can’t recognize a Stan Lee cameo at this point are probably just lost causes.